Get ready to have your mind blown! I’m going to share one of my favorite top secret kitchen tips with you. I’m going to teach you how to make an incredible, flavorful vegetable stock loved by both vegans and omnivores across the universe for PRACTICALLY FREE! I call it “Two Penny Stock” because it probably costs about two cents after you factor in the cost for electricity and water and what not. You’ll get 4-6 quarts (maybe more) of the delicious liquid gold to use as a base for soups or sauces, or you know, you can just drink it if you want. No judgement here. It’s your stock. Do what you want with it. What is the difference between stock and broth, anyway? There seems to be some debate on the topic, but most people say that stock includes trimmings and leftover bones and the like, where broth uses more meat and is richer as a result. I don’t really know. I’m no expert and, frankly, I could care less. I just call it delicious and eat it up. Okay, let’s get started. The secret to Two Penny Stock is that it takes a little planning and TIME. Time is the secret component. That, and a one gallon ziploc freezer bag. Say what? Yep. A one gallon ziploc freezer bag. Where are you going with this, Christiana? I’m so glad you asked. I’m going to tell you and it’s the key to my success as an ultra frugal expert gourmet soup maker. (very official title, I know.) Tips like this are the reason I’m able to eat lavishly flavorful meals on a beans and rice budget. I’ve been told my method is quite a brilliant one, and I think you’ll come to like it, too. So let’s get started. First of all, you’re going to take that freezer bag I mentioned and store it in the freezer. So difficult, right? You’re going to use it to save scraps from all the veggies you use every day. When you cut the ends off an onion, throw them in the bag in the freezer. (Side note, I also peel off the first layer of onion and throw that in there. You know, the tougher outer layer that no one uses, anyway.) If you peel carrots, throw the shavings in the freezer bag instead of the garbage. If you don’t use the stems to mushrooms, in the freezer bag they go. Also in the freezer goes the caps to bell peppers, eggplant, leafy ends of celery, cilantro that’s starting to look a bit too droopy, basically any vegetable scraps you come across that will freeze well and taste good in stock. I wouldn’t recommend potatoes or cucumbers, but pretty much everything else is fair game. You can also include any vegetables that are starting to look shriveled and are beyond the state of cooking. Depending on how much produce your household consumes, your bag will be filled anywhere from a week to a month, maybe two if you’re single and don’t eat a lot of produce. When your bag is full, it’s time to make stock. You could even begin with it half full, but I always like to fill it, first. Making Two Penny Stock is an easy process and you have two options. You can use a large stock pot on the stove top (which I like to do to make a larger quantity of stock when I have time to keep an eye on it), or you can use a slow cooker, which is my usual method. Now, with a slow cooker, you really can make a batch of stock with a half bag of veggie scraps, but I used a full bag because I wanted it to be highly flavorful. I had a friend coming over for dinner the next day and I really wanted to impress her with my butternut squash soup. 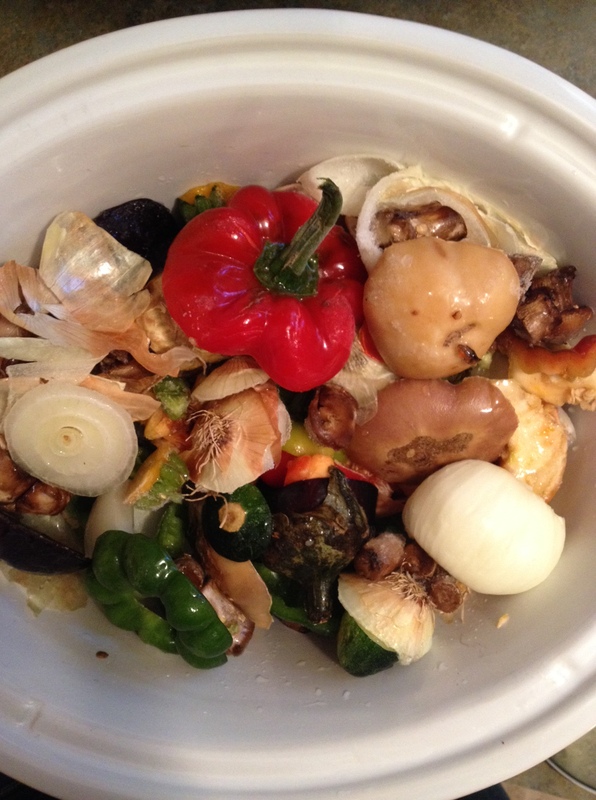 To get the process started, simply dump your bag-o-veggies into your pot of choice. See how happy your veggie scraps are in their little bath? They’re just bobbing around in there as delightfully as can be. You’ll notice now some of the bell pepper seeds have floated to the top. Yep, I saved the inside of the bell pepper, too. Now that you’re all set up, you simply turn on your slow cooker (or stovetop burner) and walk away. If you’re cooking on the stove top, check on it periodically and give it a little stir. You may want to start with a higher temp just to get it going, but then reduce it to a simmer. With a slow cooker, just leave it on and give it a stir after a few hours. How long it simmers is up to you. I like to keep mine in the slow cooker for a good 24 hours to extract as much flavor as possible, so I just leave it overnight and stir it a couple of times within the 24 hr period. I start it out on high for an hour or two to get it going, but then reduce it to low and leave it be. On a stovetop, it needs to be watched and you shouldn’t leave it while sleeping or leaving the house. It’s too risky. If I’m making a big batch on the stove top, I’ll do it on a Saturday when I plan on staying home and relaxing or catching up on housework. I’ll let it simmer for about four hours or so and stir it about once an hour. Sometimes it will simmer for longer if I have more time, and the longer it simmers, the more flavorful it will become. Forgive the condensation on the jars. Sometimes I get lazy and decide to just put the whole pot of stock in the fridge for a day or two before straining, but I’d definitely recommend getting it done as soon as the stock is finished simmering. A clunky 6 qt pot does take up a lot of precious fridge space. If you’re using your stock right away, it can be kept in the fridge for a few days, but if not, you’ll want to store it in the freezer. Be sure to leave enough headspace to account for freezing. To give you an example, I accidentally over filled my quart jar in the photo above. I usually fill it about this much, but I guess this time was slightly too full because the next day, I peeked in the freezer and the jar had cracked and the stock had dripped out. :( Sad news. Make sure you fill it a bit less than what is pictured above. The pint jar froze fine, but the larger one broke. So there you have it! Two Penny Stock! Do you feel enlightened? I sure hope so. 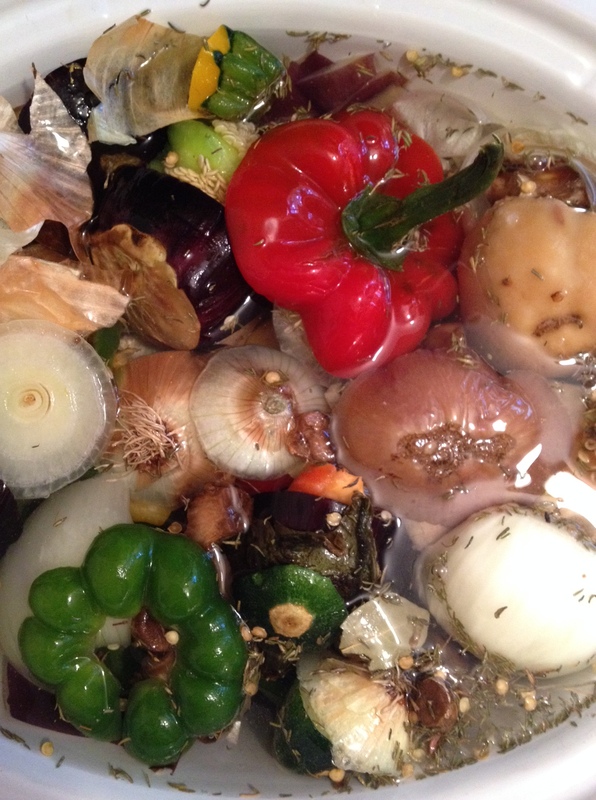 Now you can adopt my method and begin making your own flavorful veggie stock for practically free. It’s so much tastier and WAY more affordable than store bought stock. 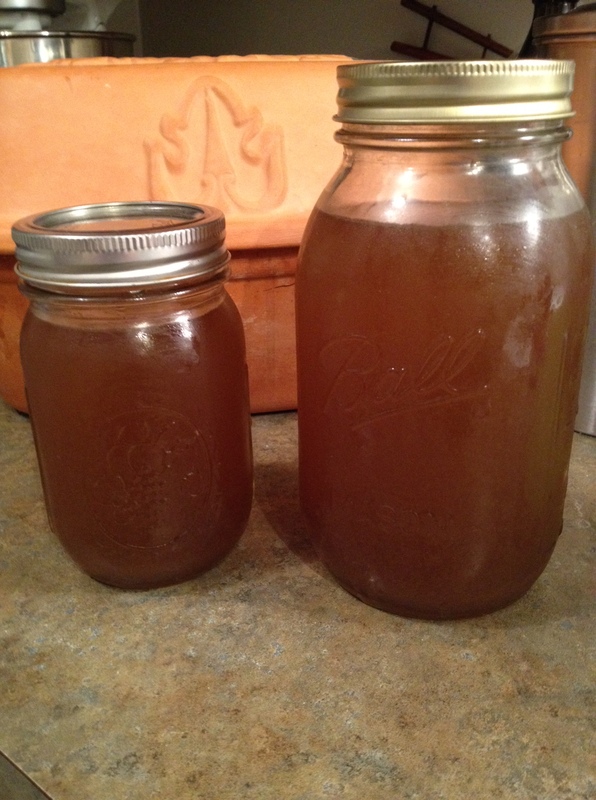 I’ve been making my own stock for a couple of years now and have yet to purchase store bought stock since. I also make homemade stock/broth every time I roast a chicken or turkey. We’ll save that for another post, though. Enjoy your Two Penny Stock and please leave a comment to share how you made it your own. Let us know if you add an unique spice to yours or what kind of meal you make from your Two Penny Stock. We’re all dying to know!